Elk live in America's toughest habitat and require maximum effort from those who hunt them. Our Elk Tracker series is built just for such a hunter, with a Bulls-Eye® Air Bob Aggressive sole for excellent traction and a lightweight, shock-absorbing comfort cork midsole. 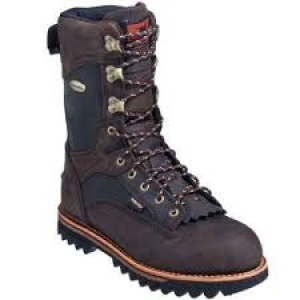 The GORE-TEX® waterproof, 12" full-grain leather uppers offer support and durability. The GORE-TEX® membrane blocks moisture from the outside, while allowing moisture inside to evaporate. GORE-TEX® has over 9 billion pores per square inch that prevent water from getting to your feet while allowing sweat vapor to pass right through, keeping your feet dry and comfortable in all conditions. An Irish Setter exclusive scent control process, ScentBan™ is added to various materials from leathers to linings to footbeds, killing bacteria that cause odors. The ultimate insulation for cold weather boots, 3M™ Thinsulate™ Ultra Insulation is thin, warm and lightweight, with the durability to withstand long hours of hard wear and keep feet warm even in damp conditions.